Cannabis is an excellent treatment option for many serious conditions, from multiple sclerosis and Parkinson’s disease, to epilepsy and cancer. But beyond debilitating diseases, many people use cannabis strains for natural pain relief: headaches, muscle aches from exercise or desk jobs, and overcoming temporary pain from broken bones, sprains, and skin conditions. In this article we’ll spend some time exploring cannabis’ ability to tackle the day-to-day pain we all face. 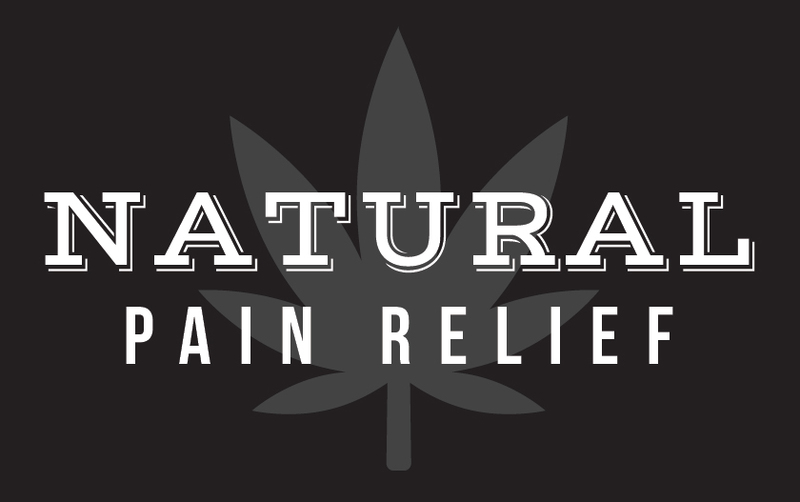 Cannabis is a good form of natural pain relief because it interacts seamlessly with the body, providing the same painkilling properties of over-the-counter painkillers like acetaminophen and ibuprofen without synthetic chemicals and frightening side effects. Cannabis contains more than 80 different compounds known as cannabinoids. These include the familiar (and best-researched) compounds THC and CBD. When cannabinoids enter the body through the bloodstream (if you smoke or vaporize) or through the tissues of the mouth or stomach (if you use tinctures, capsules, or consume cannabis oil orally), they begin immediately participating with the body’s endocannabinoid system. That’s right – our bodies have an entire system that plays well with cannabis. It’s really quite incredible. Cannabinoids like THC and CBD bind to CB1 and CB2 receptors in the body, with which pain-related neurotransmitters also interact. If a cannabinoid has filled the spot that would usually belong dopamine or serotonin, that neurotransmitter cannot alert the brain to pain at this site. If cannabinoids fill enough of these receptors, no pain messages are received by the brain, no pain is recognized, and natural pain relief is achieved. A recent US study examined 121 adult subjects, who used cannabis (both inhaled and eaten) over a number of years to treat their migraines. On average, the group’s migraine frequency dropped from about 10 per month to 4.6. More than three quarters of the subjects confirmed they experienced fewer migraines each month, and more than 10 percent found the treatment stopped their migraines altogether. Other anecdotal evidence suggests that if cannabis is consumed through a fast-acting method like vaporizing or tinctures as soon as the patient feels the migraine setting in, the plant can reverse the pain and eliminate the migraine all together. Even if cannabis can only lessen the pain, it is well-known for its ability to curb nausea as well, another common symptom of migraines. If you’ve recently suffered a break, sprain, or twisted ankle, the CBD in cannabis could prove an excellent natural pain relief treatment. Furthermore, an animal study in Israel has suggested CBD may even expedite the healing process. Cannabis doesn’t just tackle pain inside the body; it also addresses irritations on the skin, which can result in painful rashes or extremely sensitive spots (as with Shingles). While ingesting cannabis could help, many patients turn to topical products for targeted natural pain relief from skin conditions like rosacea, eczema, and psoriasis. A 2013 animal study indicated cannabis can curb skin pain and inflammation from allergic reactions and other causes. Creams and balms containing CBD and THC can also ease muscle and joint pain caused by working out or sitting for long periods of time. At FARM, we have no shortage of excellent cannabis strains and cannabis-derived products that can treat your pain, whatever its cause. Our wide range of topicals, many of which are developed here in Canada, offer a soothing alternative to chemical-laden rubs. Try lotions and creams, or aim for full-body relief with an infused bath bomb or soak. Our quality flower selection is packed with pain-killing, indica options as well as sativa options that boosts energy and focus while battling stress and pain. Approach any knowledgeable FARM budtender with your natural pain relief questions, and they will be more than happy to set you up with the ideal cannabis strain or product to suit your needs.